Most tourists visit Waikiki Beach, which forms the eastern edge of Honolulu, but it’s commonly referred to as if it’s a separate city. The beach is a popular spot for novice surfers, with a light easy roll that’s perfect for beginners. Stroll the waterfront into Kapiolani Park and walk out on the cement piers. Locals feed bread to the tropical fish. See reef triggers, angelfish and stick fish up close. Wander through the International Market Place – the renovations in 2016 created a modern shopping complex around the original banyan tree. Stop on almost any street corner to visit an ABC Store. Buy chocolate macadamias, snacks and knick-knacks. Spend time in the waterfront Kapiolani Park among the banyan trees. The Honolulu Zoo and the Aquarium are in Kapiolani Park. Hawaiians love to set up large family picnics in their parks on weekends. Pearl Harbour – the number one attraction on Oahu. Pearl Harbor would be about a $30 cab ride from Waikiki. It’s the World War II memorial to the bombing of the US Navy by the Japanese. The highlight is a walk out on to the surface of the sunken USS Arizona, which can be a sobering moment. Diamond Head marks the end of Kapiolani Park. Drive through a tunnel into the center of this extinct volcano in Diamond Head State Monument and then climb to the top to the World War II bunker. It’s a tradition to reach the summit at sunrise. Hike up through the switch backs, stone steps, tunnels, spiral metal stair cases and a bunker to reach the top. Well worth the effort. Iolani Palace, the Aliiolani Hale building and Hawaii State Capitol. Take the #2 or #13 to the Iolani Palace and back when you visit Waikiki. The #2 runs about every 10 minutes. Dinner overlooking the beach and Diamond Head at the Shore Bird Restaurant & Beach Bar in the Outrigger Reef on the Beach. Dinner with a 360 degree view from the three tier roof top revolving restaurant at the Top of Waikiki revolving restaurant. Eat at the Grand Lanai in the International Market Place. Aston Waikiki Beach Hotel – the Select Oceanview units have nice views down the beach from this waterfront hotel. Tiki’s restaurant on the 3rd floor is a great spot to watch the sun go down and listen to local contemporary Hawaiian live music. Outrigger Reef Waikiki Beach Resort – on the waterfront at the west end of the beach. 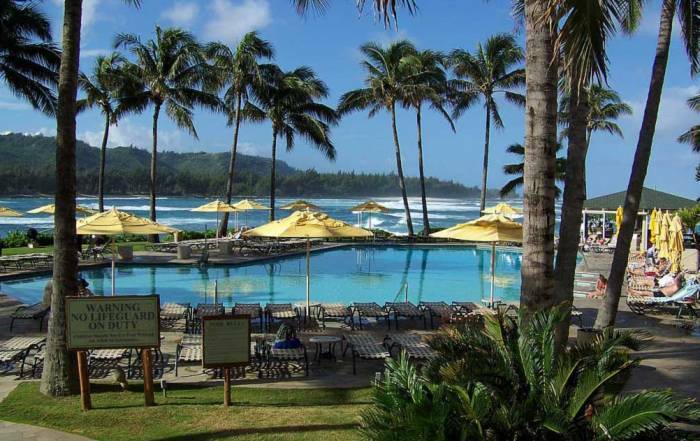 Sheraton Princess Kaiulani – have a meal by the pool, including evening Hawaiian entertainment, even if you are not a guest. 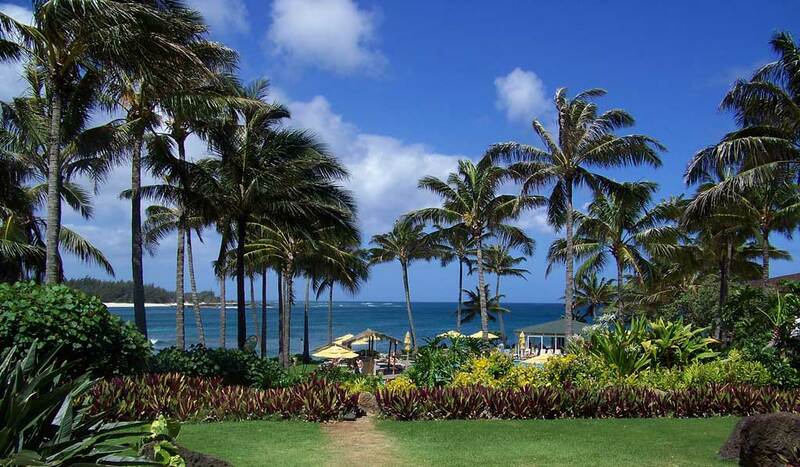 Hilton Hawaiian Village – The Hilton Hawaiian Village is located right on the waterfront and it also has its own man-made Duke Kahanamoku Lagoon which makes for safe, child-friendly swimming too. Each morning children have an opportunity to pet an African penguin and watch them being fed. There are also macaws, turtles and African cichlids to see. Take a trolley or city bus to Kapiolani Park with its magnificent banyan trees, the International Market, the Aquarium and the Zoo. A great choice for a family vacation. 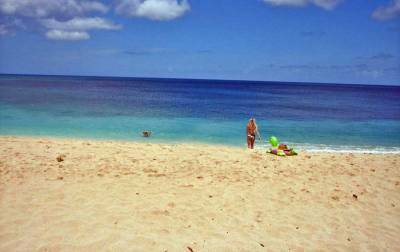 The Royal Hawaiian – real Hawaiian atmosphere and a price not everyone can afford. Sheraton Waikiki Hotel – directly beside the Royal Hawaiian, with units aligned perfectly to view the beach and Diamond Head. 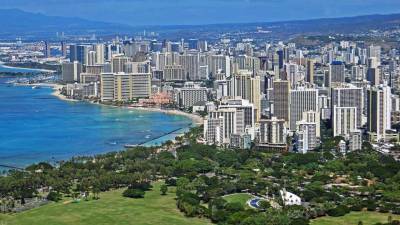 Park Shore Waikiki – directly across from the Beach, the zoo and Kapiolani Park. It has reasonably priced rooms at the back. You can’t beat this location. 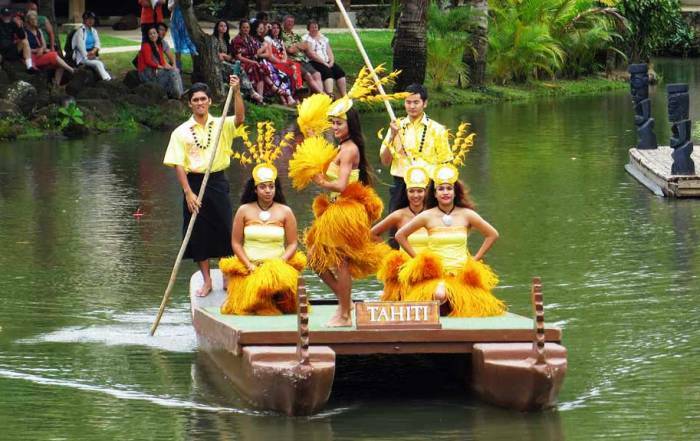 Ohana Waikiki West – popular with families and with groups tours, especially school groups. The units are reasonable, but the showers are small and there are no tubs. It’s a short walk to the beach at Waikiki. 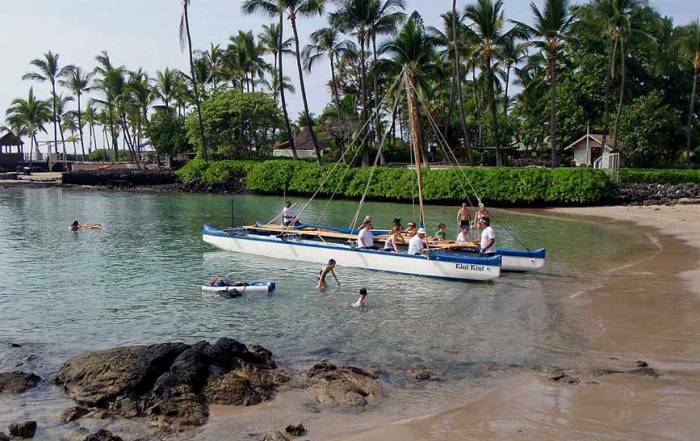 The Ohana West is part of the Outrigger chain of hotels. Waikiki Banyan Condos, which has kitchenettes. A rental car is an easy way to take an Oahu Island Drive day trip around the island of Oahu when you visit Waikiki. 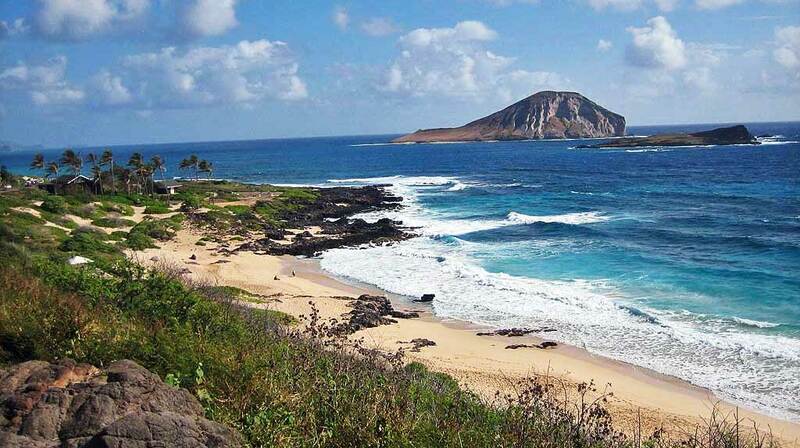 The southeast corner of Oahu is one of the nicest areas in the Hawaiian Islands. 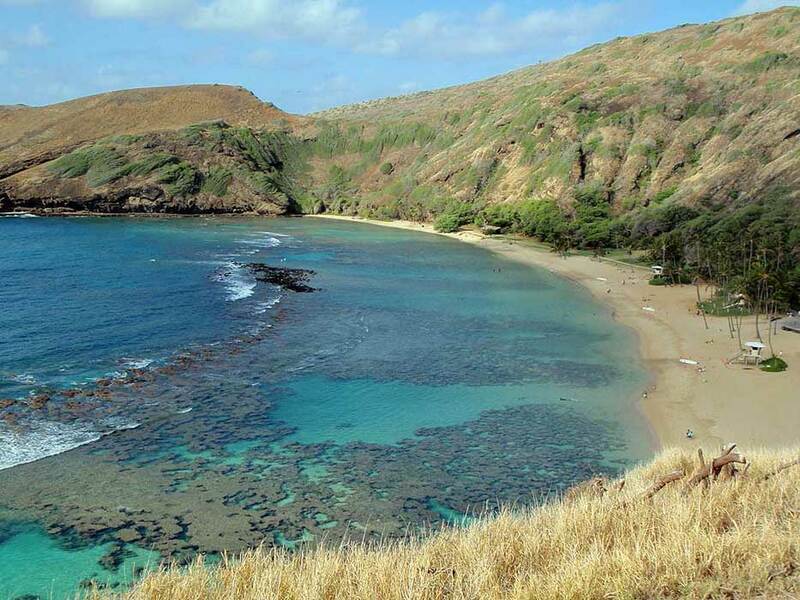 The beaches are so distinctive here: Hanauma Bay for snorkelers, Sandy Beach for surf and sun or Makapu’u for body surfing. 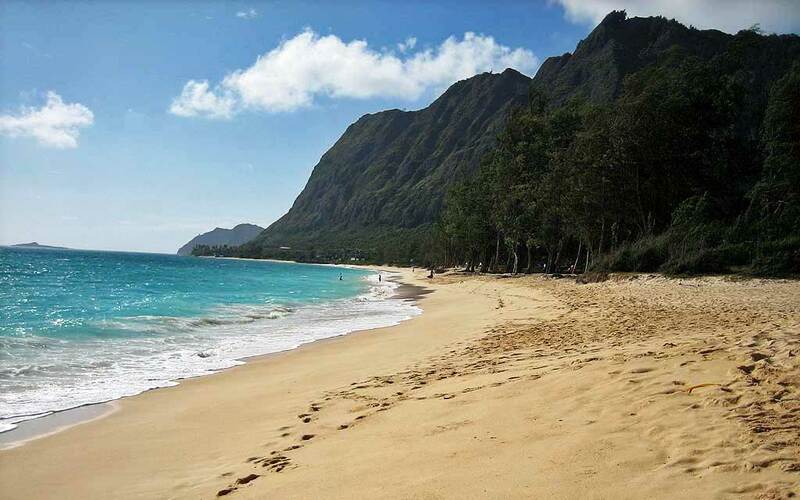 You can walk along Waimanalo Beach against the backdrop of mountains so close you wonder how the beach fits in. Check out the Makapu’u Point Lighthouse Trail. Hike the World War II railway tie staircase of over 1,000 steps at Koko Crater. The Haiku Stairs (Stairway to Heaven) is officially closed, but many adventurous hikers still find ways to risk climbing the steps. The drive around the Oahu Island had some other lovely spots, including Lanikai Beach, Turtle Bay Resort and Sunset Beach. Other popular stops include the Polynesian Cultural Center, the Dole Pineapple Plantation for pineapple ice cream, Sea Life Park, Ho‘omaluhia Botanical Garden and Byodo-In Temple. Spam – introduced by the American Army during World War II and still popular today in Hawaii. It’s on the menu at McDonald’s. Try spam musubi – grilled spam on rice. Shave ice – a Hawaiian variation on the snow cone. The slivers of ice hold more flavor. Try some sweet and sour on top. The famous Luau with pork, sweet potato and taro slow cooked in an earth oven. 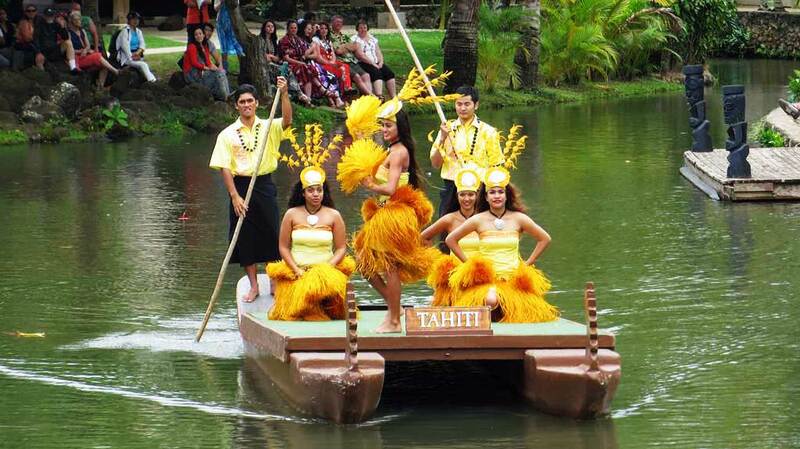 Huli Huli Chicken – huli means “turn” and refers to the repeated turning of chicken on a barbecue. DoleWhip – the popular pineapple ice cream served at the Dole Plantation. Ahi – yellow fin tuna. Poke – cubed raw fish preserved in salt. The term is now applied to any cubed meat. Pupu – appetizers or just a very funny word. Whenever you visit Waikiki weather is fairly consistent on a year round basis. Permanent residents will think winter is significantly cooler. In the summer months from June – October expect Waikiki weather to have average highs around 88 F (31 C) and average lows are about 75 F (24 C). In January and February, average highs are about 81 F (27 C) and lows are roughly 66 F (19 C). The summer months are dry. From October – March about 2 inches (60 mm) of rain falls each month. 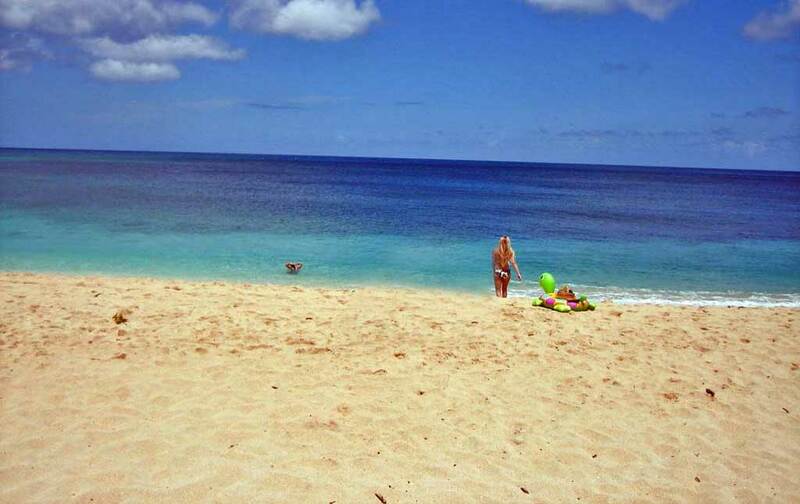 Summer is a popular vacation time for Hawaiians, but most visitors choose winter and spring break for their visits. Cab fare in 2015 to Waikiki without tip was about $45, which makes cab a reasonable choice for 2 or 3 passengers. Speedi Shuttle – friendly customer service that ranks Speedi Shuttle as our number one recommendation for Honolulu airport transfers. Prices in 2015 without tip were $15.50 per person. Take the #19 or #20 Honolulu City Bus between the airport and Waikiki. The price of $2.50 per person can’t be beat, but this is local transit with no luggage storage. Luggage must fit on your lap or under the seat. Expect to spend about an hour on the bus. For visitor transportation to get around Waikiki, the Waikiki Trolley operates several routes. 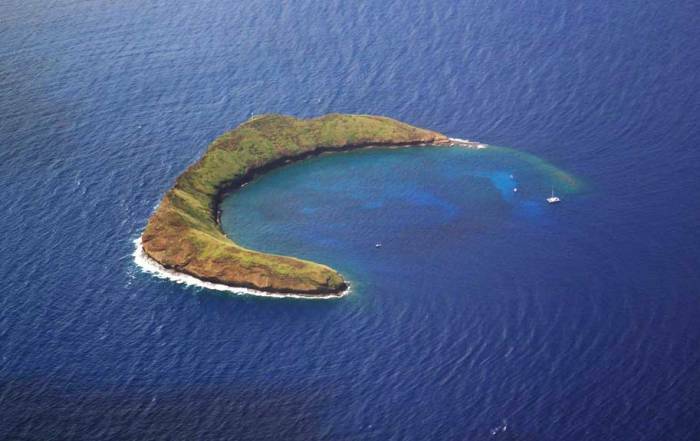 The Honolulu City Bus is a great method to get to Diamond Head State Monument, Hanauma Bay or Sea Life Park. Bus fares in 2015 were $2.50 one way and exact change is required. The Honolulu bus system announces the attractions at each stop, so it’s easy to find your way around. 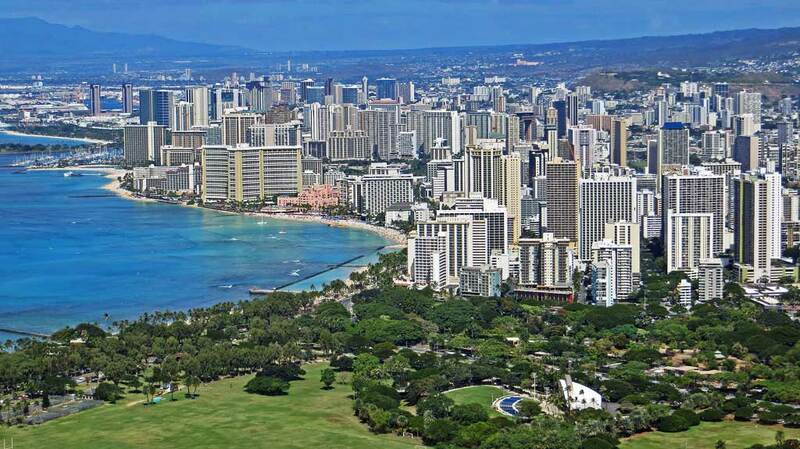 Waikiki is synonymous with Hawaii, but it’s located on the island of Oahu and not the island of Hawaii. 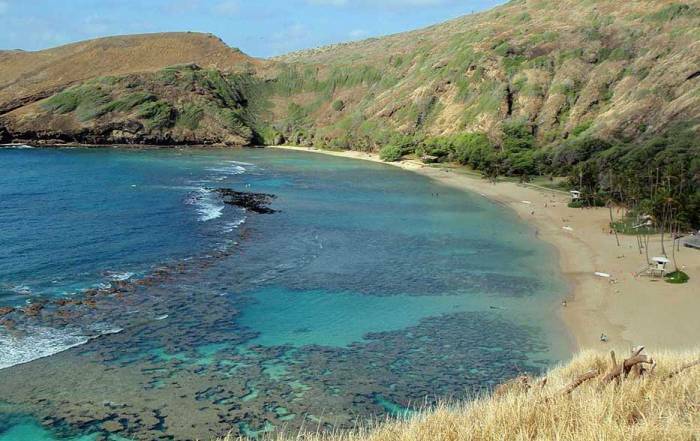 The Waikiki beach area used to be a favorite vacation spot for Hawaiian royalty. Today it’s a favorite tourist vacation spot. 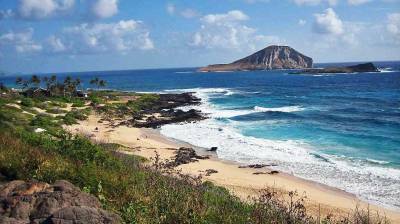 The island of Oahu has been greatly influenced by World War II and the bombing of Pearl Harbor by the Japanese on December 7, 1941. Resentment toward the Japanese still persists, but it is fading into the past. 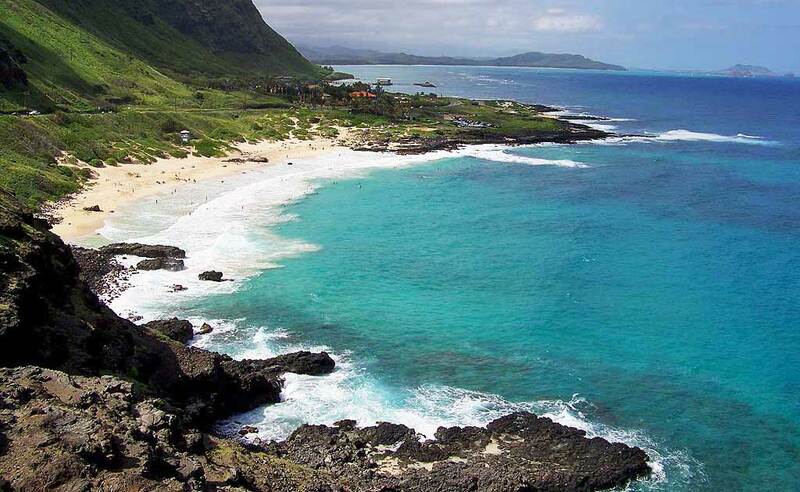 In fact, you will find the people of Oahu to be among the friendliest and most optimistic in the world.